Stir fries are a quick and easy meal that can include just about anything except the kitchen sink. The basic technique requires an array of vegetables, a protein and a sensational stir fry sauce. In most cases, the protein should be cooked before the vegetables unless it is a seafood stir fry in which case you want to give the veggies a head start. You can use anything from chicken to beef to tofu or shrimp. Give this simple recipe a try and let me know how it goes in the comment section below. Step 2: In a small bowl, whisk together the soy sauce, rice vinegar, brown sugar, garlic, ginger, cornstarch, sriracha and sesame oil until ingredients are well combined. Set aside. Step 3: Heat oil in a large skillet or wok over medium high heat. Add the broccoli and red bell pepper. Cook for 3 to 4 minutes or until vegetables begin to soften. Add the shrimp and water chestnuts and cook an additional 2 to 3 minutes. Next, add the stir fry sauce and mix until all ingredients are evenly coated. 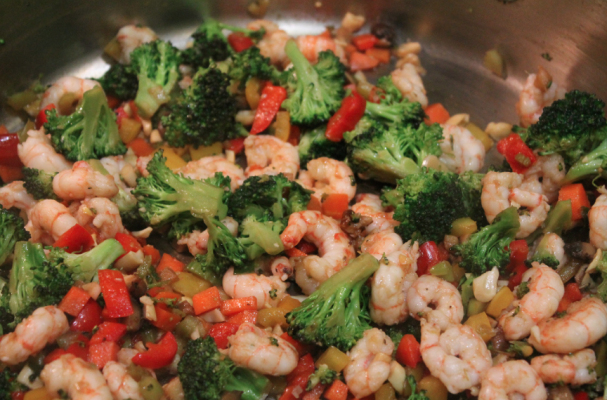 Continue cooking stir fry until sauce thickens and shrimp just turn pink. Step 4: Remove from heat and garnish with green onions and sesame seeds. Serve hot with rice.